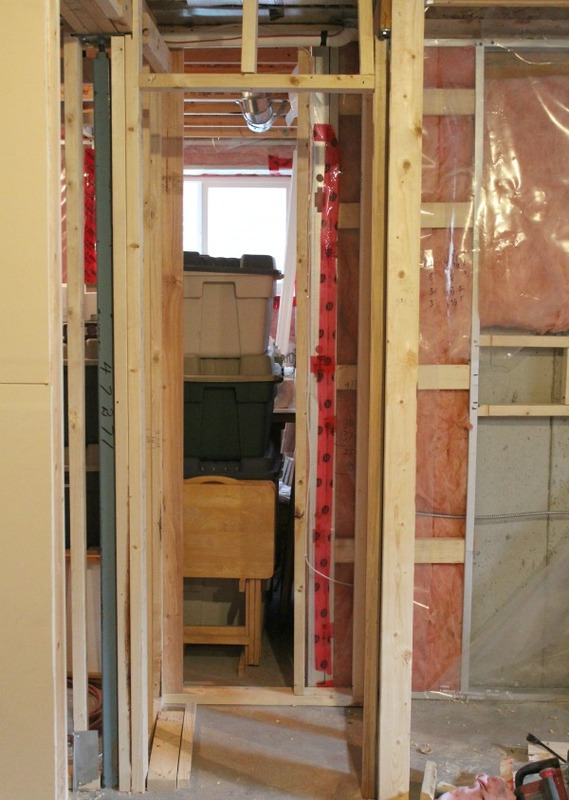 Sharing the framing and electrical updates as we work on finishing our basement. We’re making good progress! Although we’ve only completed the framing and rough-in electrical work of our basement renovation, I can get a pretty good sense of how the rooms are going to look. We’ve made some adjustments along the way, but careful planning beforehand has definitely paid off. Our original plan looked something like this sketch my husband put together. 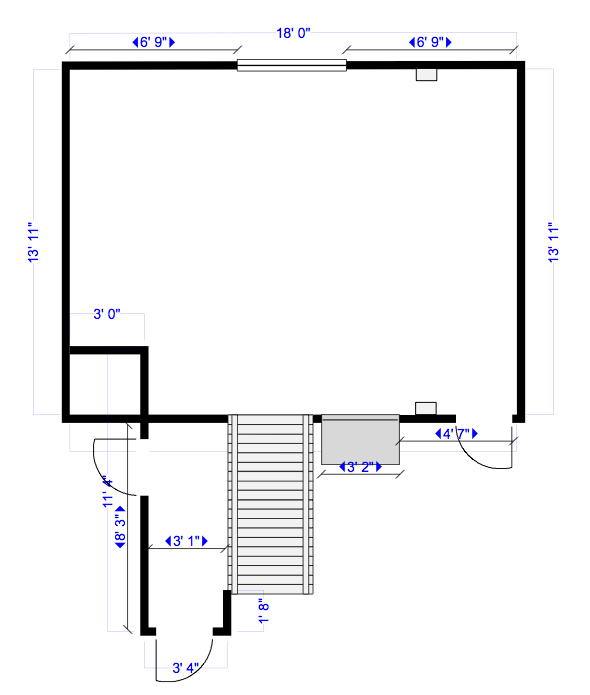 The entire room that you see at the bottom of the stairs is going to be our media room or family room. The wall to the left is where we will mount our TV and speakers for the Bose sound system. We added extra support for the mounting bracket and created boxes in order to recess the speakers. 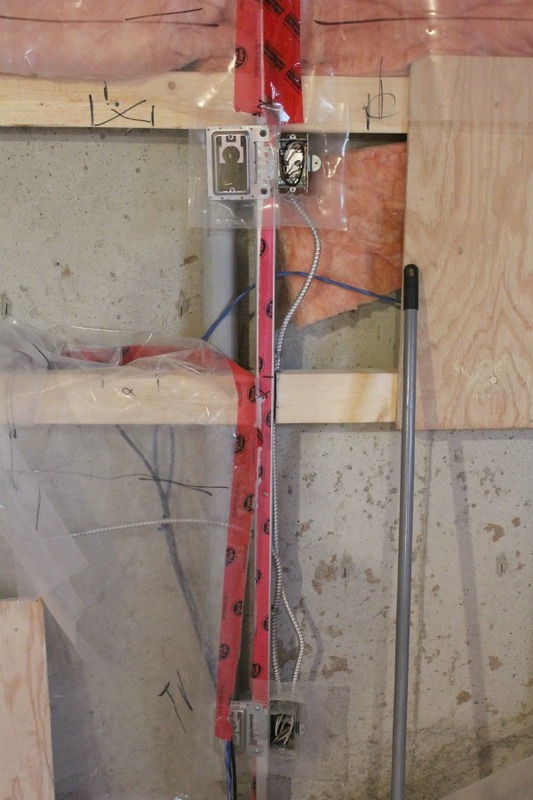 In addition, all the wiring was integrated to keep it hidden once drywall goes up. Our electrician installed a tube in the wall leading to the connections for the TV down to those for the PVR, gaming device and DVD player. These electronics will all be housed in a media console (I’m currently on the hunt for). 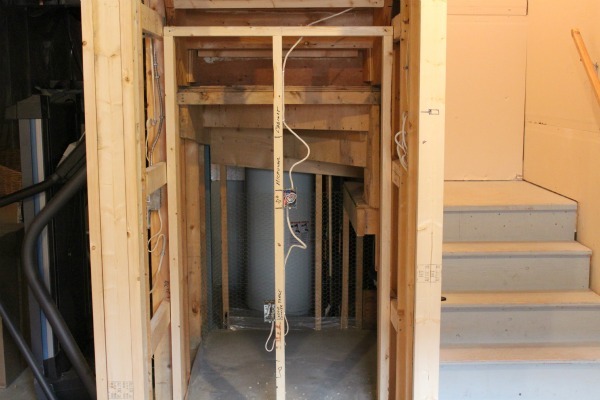 The small area to the left of the stairs (as shown below) is a niche created by the top portion of the wrap-around. This is where our snack bar (aka non-wet wet bar) will be, including a beverage fridge and cabinets. We also had a recessed fixture installed directly in front of the upper cabinets for extra light. Directly beside the snack bar will be the entrance leading to our storage area. 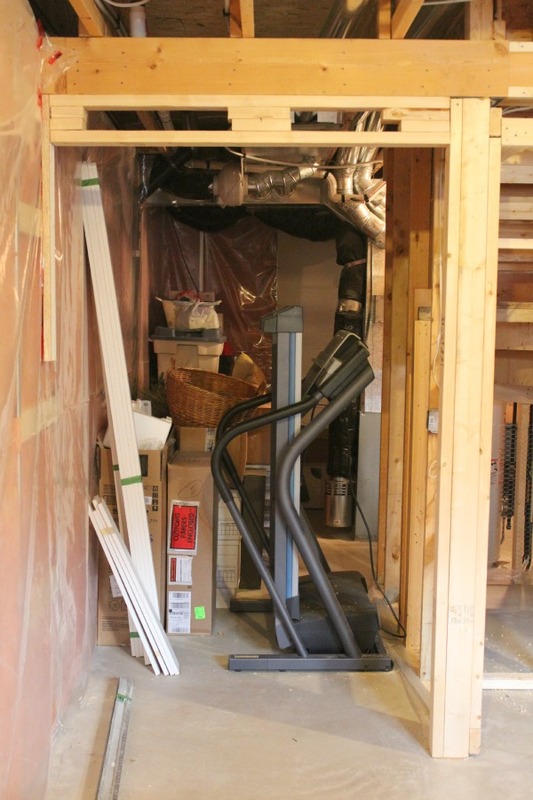 Originally we were going to install a regular door, but we quickly realized that moving the treadmill, as well as larger items in and out of the room would be a challenge. We decided to frame it for double doors instead. They will look something like these double shaker style closet doors. 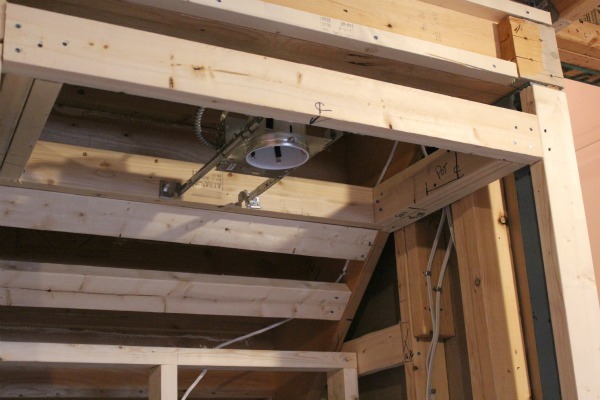 A few other features of the framing and electrical work in the media room included a closet, recessed fixtures in the ceiling, additional outlets and heating vents. 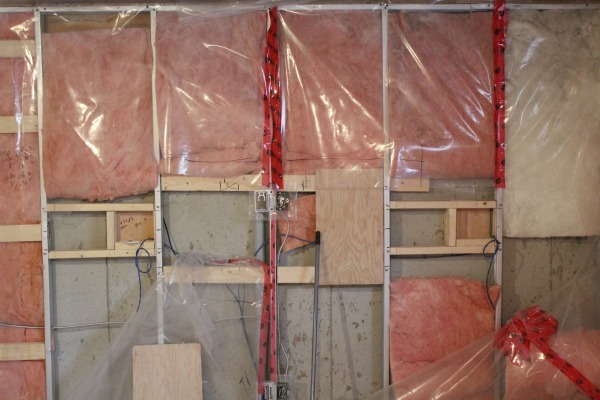 The next stage of the process will be installing the sound barrier and insulation in the ceiling and then on to drywall. I’m looking forward to the peace and quiet! 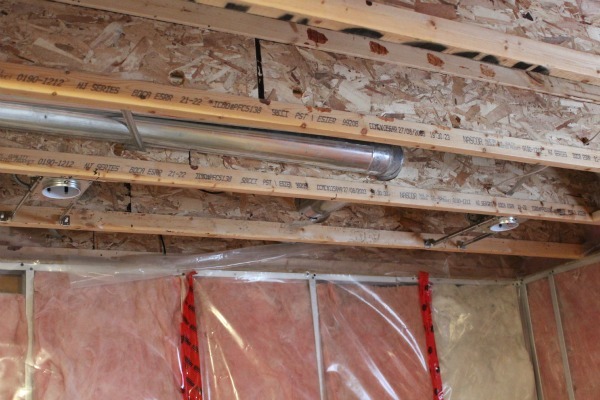 Click here to follow the entire basement renovation series. Thanks for following along! Oh it is coming along! It will be to the fun stuff in no time! Yes, I’m looking forward to seeing the drywall up! wow, everything seems to be coming along! love love the double shaker doors! Can’t wait to see more. Thanks Mandy. I’m really excited about those double doors!